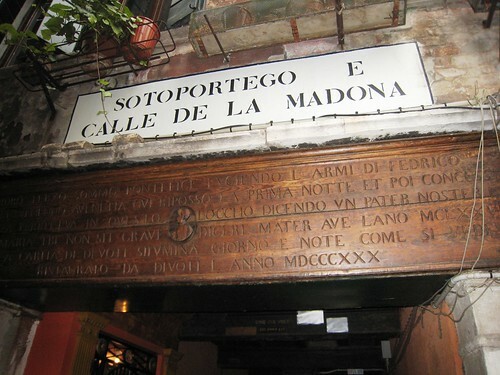 The “Sottoportego della Madonna” is located on a street that connects Campo S. Aponal and Campiello Meloni in the district of San Polo. “Alessandro III il sommo pontefice fugiendo l’armi di Federico imperatore venendo a Venezia qui riposso la prima notte e poi concesse indulgienza perpetua in questo l’occhio dicendo un Pater Noster et un Ave Maria tibi not sit grave dicere Mater ave l’anno MCLXXXVII con la carità dei devoti silumina giorno e notte da divolti l’anno MDCCCXXX”. Pope Alexander III who was chased by Emperor Frederick Barbarossa, fled to Venice, and it seems that the first night he slept under this porch. In memory of this it was placed a sleeping Pope sculpture inside a Marian shrine. The Pope put a special blessing here for anyone who comes inside and prays before the shrine, according to the wooden plaque above the entrance. There are several other legends about this pope-on-the-run. One is that he worked as a janitor for six months at the convent of La Carita before someone recognized him and helped restore him to power. He also spent the night on the portico of the church of San Salvador. Eventually, the Venetian Republic (a neutral party in the dispute) intervened and negotiated reconciliation between the two enemies, and the spot where they kissed and made up is marked with a stone on the floor of Basilica di San Marco. Visit it because it has a fantastic story.